Hailing from the Food52 column entitled "Genius Recipes," I don't even know where to start with the sheer brilliance of this Whole Roasted Cauliflower with Whipped Goat Cheese recipe. Is it the presentation's artistic forte, a perfectly crackled crust atop a dome of bronzed brassicaceae? Is it the extraordinary aromatic broth, punchy and piquant, precise for poaching? Is it the whipped goat cheese topping, sinfully creamy, finished masterfully with a light drizzle of olive oil and sea salt? Or is it the fact that this silly, under-appreciated vegetable is elevated to steak status, treated with utmost sophistication and refinement? The answer (D! All of the above!) is obviously a combination of each of these things. And why—in my own streak of genius—I, the cauliflower steak cooking virgin, took the plunge and tried this for the first time on a crowd. Big risk, big reward: it received an overwhelmingly positive response, and therefore I get to share with you! 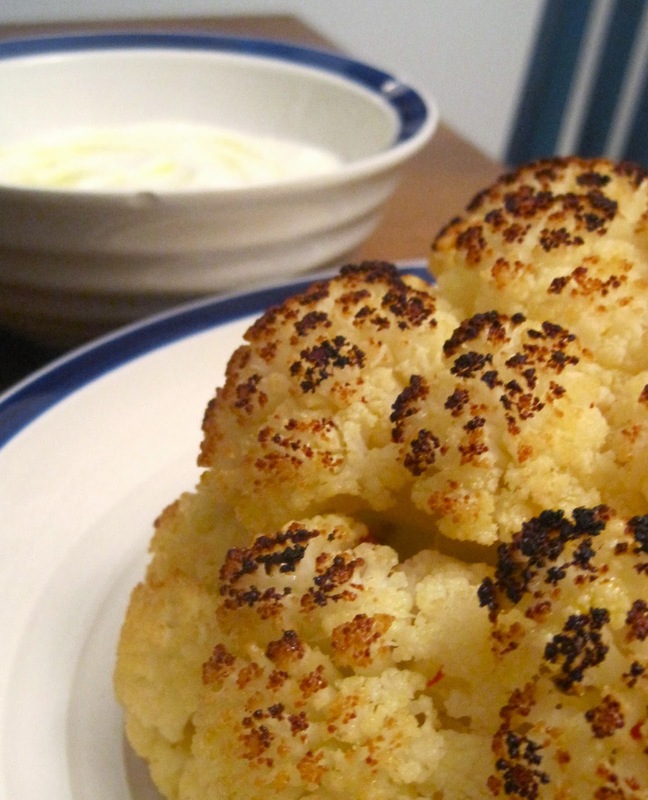 Though roasted whole, the cauliflower works best as a side—cut into wedges to split amongst diners. The recipe makes a more than generous amount of whipped goat cheese (its pretty rich), so I recommend halving the recipe if you don't plan to use it as a sauce for other things. (Have faith though, I would literally eat it slathered on a rock.) The poaching liquid, which falls quizzically into the "best thing I ever ate" category despite utilizing only pantry items, can also be reserved for other uses: you can save it to make this recipe again the very next night (I did!) or use as a broth for mussels, pasta, or zuppa di pesce. The original recipe is written by Alon Shaya for Bon Appetit, was slightly adapted by Kristen Miglore for Food52, and further adapted (lightened up) by me. I've proactively eliminated all butter, cream cheese, and cream; leaving all decadence to the poaching liquid and goat cheese, and of course, the natural flavors of the man of the hour, le cauliflower. Heat oven to 475° F. Bring wine, oil, a generous sprinkle of salt, lemon juice, red pepper flakes, sugar, bay leaf, and 8 cups water to a boil in a large pot. Carefully lower in cauliflower, reduce heat, and simmer, turning occasionally, until a knife easily inserts into center, 12 minutes. Using 2 slotted spoons or a mesh strainer or spider, transfer cauliflower to a rimmed baking sheet or roasting pan, draining well. Reserve at least ½ cup of poaching liquid. Roast, rotating pan halfway through, until brown all over, 30 to 40 minutes. When cauliflower is finished roasting, transfer to a plate. Spoon a few tablespoons of poaching liquid over the cauliflower. Serve with whipped goat cheese.